Losing an animal is devastating for young and old alike. Our pets are part of our family and for many losing them is like losing a family member. When we lost Lucky, our Golden Retriever, a dear companion who had been with us a long time, we were all devastated. Lucky was a key character in the very first Toby’s Tails book as Toby’s mentor, and I felt his passing couldn’t Losing an animal is devastating for young and old alike. Our pets are part of our family and for many losing them is like losing a family member. 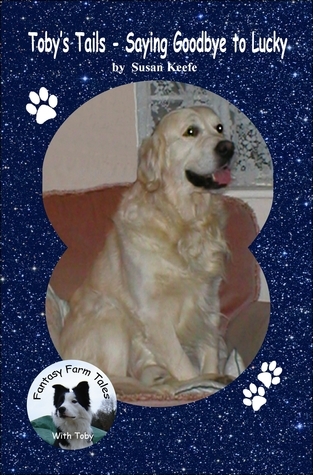 When we lost Lucky, our Golden Retriever, a dear companion who had been with us a long time, we were all devastated. Lucky was a key character in the very first Toby’s Tails book as Toby’s mentor, and I felt his passing couldn’t go unmarked. I like many others believe that animals have souls. When I read that the Zulu and Ndebele people who live in southern Africa believe that the stars are their dead ancestors watching over them, I thought that this was wonderful. So I decide to write this book believing that this would be a gentle way of explaining to children, the passing of a loved pet, or human family member, and a way for them to come to terms with their loss. To ask other readers questions about Toby's Tails, please sign up. Heart-warming and beautifully written. Children’s author, Susan Keefe was devastated when she lost her beloved Golden Retriever, Lucky, a key character in her series of ‘Toby’s Tails’ books. As Toby’s mentor, his owner felt Lucky’s passing couldn’t go unmarked. Thus, this delightful story (Fantasy Farm Tales Book 6) is dedicated to Lucky’s final days, told from the point of view of Toby, the border collie. Losing a family pet can be a terrible experience for children and the author has skillfully Heart-warming and beautifully written. Children’s author, Susan Keefe was devastated when she lost her beloved Golden Retriever, Lucky, a key character in her series of ‘Toby’s Tails’ books. Losing a family pet can be a terrible experience for children and the author has skillfully penned this story with the aim of gently explaining the process so they may be able to come to terms with their loss. As I did, I’m certain young readers will be comforted by Lucky’s story, and view it as a celebration of his “lucky” and beloved life, rather than some painful account of his death. I particularly loved the author’s note about the southern African Zulu and Ndebele people, who believe that the stars are their dead ancestors watching over them. And how, each time she looks up to the night sky, she remembers Lucky. This book was a very difficult book to write. Lucky had been a large part of our life and a much loved member of the family. Losing a pet is devastating and I know how hard it is to come to terms with the loss, both as an adult and child. Because Lucky had been such an important part of the Toby's Tails books I decided that his passing would give me the opportunity to help children come to terms with this very difficult part of life. When I read that the Zulu and Ndebele people who live in southe This book was a very difficult book to write. Lucky had been a large part of our life and a much loved member of the family. Losing a pet is devastating and I know how hard it is to come to terms with the loss, both as an adult and child. Children’s author, Susan Keefe was devastated when she lost her beloved Golden Retriever, Lucky, a key character in her series of ‘Toby’s Tails’ books. Losing a family pet can be a terrible experience for children and the author has skillfully penned this story with the aim of gentl Children’s author, Susan Keefe was devastated when she lost her beloved Golden Retriever, Lucky, a key character in her series of ‘Toby’s Tails’ books. Susan Keefe has done it again with this latest charming addition to her Fantasy Farm Series which chronicles the lives of her and her husbands’ pets and the animal residents of their French smallholding. This time it’s Lucky the elderly golden retriever whose story is told in Susan’s gentle, compassionate style – well, it’s actually the telling of his final few days and peaceful death. That might sound rather distressing to animal lovers of all ages, but believe me; it’s sad but not painful. Luck Susan Keefe has done it again with this latest charming addition to her Fantasy Farm Series which chronicles the lives of her and her husbands’ pets and the animal residents of their French smallholding. This time it’s Lucky the elderly golden retriever whose story is told in Susan’s gentle, compassionate style – well, it’s actually the telling of his final few days and peaceful death. That might sound rather distressing to animal lovers of all ages, but believe me; it’s sad but not painful. Lucky has had a good long life, been much loved, and goes Gentle into the Good Night. This is a very touching handling of what might have been a difficult subject for small children and the author narrates it in a sensitive, non-frightening manner. And the symbolism she uses for Lucky’s departed soul is simply beautiful. Congratulations to her on another superb little book. Award Winning Children's Book Author, Susan Keefe has written the Fantasy Farm Tales series for children who love animals. The books offer a wealth of information about family pets and the natural world. The star is Toby her Border Collie, and all the animals live on or near her smallholding. There are 8 Fantasy Farm books at the moment and Toby's Tails - Easter at Fantasy Farm won the Favorite Ho Award Winning Children's Book Author, Susan Keefe has written the Fantasy Farm Tales series for children who love animals. The books offer a wealth of information about family pets and the natural world. The star is Toby her Border Collie, and all the animals live on or near her smallholding. There are 8 Fantasy Farm books at the moment and Toby's Tails - Easter at Fantasy Farm won the Favorite Holiday Book category in the 2016 Summer Indie Book Awards. Toby's Tails (Book 1) has been nominated as the Judges' choice in Golden Box Book Awards 2017. Coming soon: A special story about an abandoned kitten who comes to live at Fantasy Farm. Some of the Fantasy Farm series are also available in French and Spanish. Also available in French Toby et Compagnie - Le Mystere du Poulailler translated by Emilie Baudrez. and Spanish - La Patrulla de las Gallinas (Fantasy Farm Tales nº 2) translated by Jose Luis Cortes. Also available in French - Toby et compagnie ? Les chatons de Noel translated by Emilie Baudrez. and Spanish - Las aventuras de Toby ? Los Gatitos de Navidad (Fantay Farm Tales nº 5) (Spanish Edition), translated by Jose Cortes. 10% of the profit of each book sold will be donated to Hélianthus, an animal charity based in Pre-en-Pail, France.